Alternative Armies 15mm Fantasy range. Unpainted white metal castings. Manufactured by Alternative Armies, Girvan, Scotland. 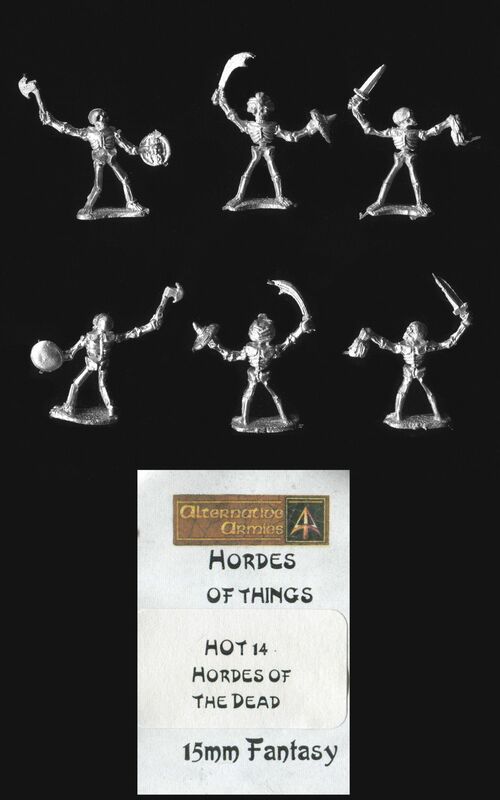 These figures were designed to provide armies for the Wargames Research Group Hordes of the Things rules (HOTT). A skeletal warrior wielding a sword in its right hand and holding what appears to be a severed head in its left. The figure is approximately 17mm tall. A skeletal warrior wielding a scimitar in its right hand and holding a small round shield on its left hand. The shield has a sharp point instead of a boss and should be considered as a parrying weapon. The figure wears an turban style headdress. The figure is approximately 18mm tall. A skeletal warrior wielding an axe in its right hand and carrying a small round shield on its left arm. The figure is approximately 17mm tall. The original pack contained sixteen figures from four different designs – we have listed these separately in groups of six figures. The picture of the painted figures is taken from the Alternative Armies website.